The tenth anniversary of the genocide in Darfur has focused renewed attention on the crimes that the Sudanese regime has committed against its people and the pending International Criminal Court (ICC) arrest warrants for President Omar al Bashir and other Sudanese officials. But the fact that the regime’s crimes extend far beyond Darfur and continue to this day has remained under the radar. Every day, the regime is brutally targeting its own civilians in its South Kordofan and Blue Nile states through regular aerial bombardment and the deliberate burning and destruction of civilian structures. Substantial evidence now exists proving that these tactics — honed in Darfur and the long civil war with the south — constitute atrocity crimes that meet the formal legal definitions of war crimes and crimes against humanity. It is time for the U.N. Security Council to fulfill its responsibility to protect victims of atrocity crimes and expand the ICC’s mandate to allow the prosecutor to investigate charges against Bashir and his henchman beyond the narrow Darfur authorization. While most of the world has been distracted by other events, human rights groups have steadily accumulated evidence of crimes in Sudan’s South Kordofan and Blue Nile states. Human Rights Watch and Amnesty International have released report after report decrying the situation. Now, groups like the Satellite Sentinel Project (SSP) and Nuba Reports are combining satellite imagery with on-the-ground reporting and legal analysis, to make a case for action. The internationally-accepted Responsibility to Protect doctrine demands action in these types of situations. Among other steps, it allows the Security Council to refer the situation in South Kordofan and Blue Nile to the International Criminal Court. In the meantime, the UN should establish a Commission of Inquiry to investigate, document and legally characterize the alleged war crimes and crimes against humanity in Sudan’s two southern states. What evidence have human rights groups already been able to see and document? Reporting confirms destructive acts by Sudanese government soldiers, the Central Reserve Police, also known as Abu Tira, and government-backed militias including the deliberate burning and looting of hundreds of civilian structures: churches, mosques, marketplaces, and schools. Imagery also shows the indiscriminate bombardment of civilian populations in a number of villages and the deliberate burning of at least 26 villages and 292 square miles of fields and grasslands in the two states. If tied to compelling legal analysis, this evidence, gathered through a combination of cutting edge technology and old school human rights reporting, can now be taken to the next level. There is already enough evidence to demonstrate that atrocity crimes that fall under the ICC’s scope are happening in South Kordofan and Blue Nile. Satellite images document state actions that match the Geneva Conventions’ definition of war crimes, including intentional attacks against civilian populations; intentionally attacking buildings used for religious services, schools, and hospitals; and pillaging or looting a village. Reports also support a finding that state attacks against civilian populations are widespread and systematic enough to pass the threshold for characterization as crimes against humanity. The evidence is available. We need to make sure the International Criminal Court gets jurisdiction over the question. The United Nations should immediately establish a Commission of Inquiry into situation in South Kordofan and Blue Nile states. Using SSP’s and other human rights groups’ evidence as a starting point, the Commission of Inquiry could gather additional evidence to support another Security Council referral to the ICC. Even before this commission is established, members of the international community must endeavor to collect as much evidence as possible of ongoing crimes from refugees and other victims. Bashir’s regime governs by marginalizing the populations living at the country’s peripheries. As a consequence, the people in South Sudan, the East, and Darfur have violently opposed the central government’s rule for decades. The government’s brutal response to the Sudanese opposition’s efforts to secure a more inclusive society is now infamous. Sudan’s own armed forces and state-sponsored proxy militias have been indiscriminately attacking civilian populations on the periphery for years. Now, these atrocities, which were previously committed unobserved, are being monitored and documented. The era of impunity for atrocity crimes committed unobserved in remote areas is coming to an end. The model of melding new technologies of satellite imaging and commonly available cell phone video with on-the-ground reporting has already produced evidence that no regime can deny. The U.N. and the ICC should mark the tenth anniversary of the Darfur genocide by continuing to move forward toward accountability and justice for all the people of Sudan who have suffered under the Bashir regime. 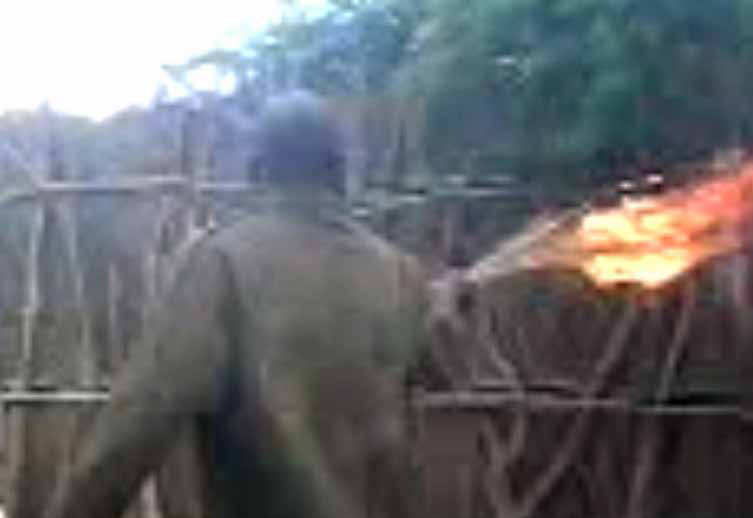 Photo: Match Battalion Member Torches Village; Credit: Eyes and Ears Nuba.